A generational shift is coming to the air cargo industry: airlines are poised to bring freight consolidation in-house. By optimizing for weight and volume at the plane level through dynamic real-time pricing, air cargo carriers will increase both their per-plane cargo yields and profit margins. For decades, air freight consolidation has been dominated by master consolidators, middlemen with a simple business model: buy space from airlines and sell it at a markup to shippers. 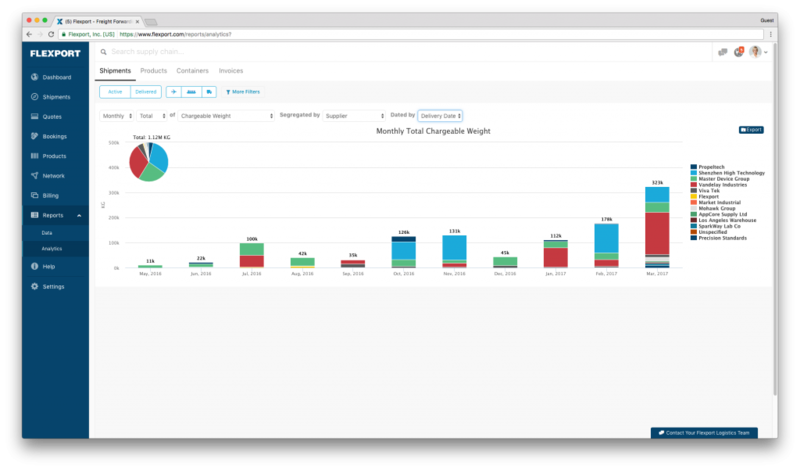 The consolidators can improve margins by consolidating multiple customers’ cargo in a single shipment, charging customers with dense cargo by weight, and those with voluminous cargo by size. The result of this volumetric mixing is called “free margin,” every master consolidator’s two favorite words. By embracing master consolidators and the third-party consolidation market, airlines have outsourced their risk, but they’ve also outsourced their margins. That’s all about to change: the advent of real-time dynamic pricing for air freight sold through digital marketplaces will allow airlines to consolidate freight at the plane-level instead of the pallet-level. Until now, consolidators have been necessary because they provide human beings on the ground to sort, weigh, and consolidate cargo as it’s coming in. However, the growing presence of online air freight marketplaces will enable airlines to raise and lower prices for different types of freight algorithmically, moving toward an ideal consolidation for every flight. Planning the consolidations with web-based software will give them visibility into cargo that is weeks away from reaching the consolidation point. The resulting predictability will eliminate all of today’s scrambling to mix-and-match boxes on a pallet: airlines can take whatever freight a customer offers, and then instantly lower the price for complementary freight or raise the price for incompatible freight. Soon it won’t matter whether any given pallet or ULD is optimized for the weight-volume ratio best suited for the plane, as long as the pallets in aggregate reach the optimal weight-volume ratio. Real-time dynamic pricing will lead customers to send cargo with the exact attributes the airlines need to optimize the space in their holds. What’s more, by providing pricing and capacity data through APIs and web interfaces, airlines will be able to reduce transaction costs for both the forwarders and shippers they work with. 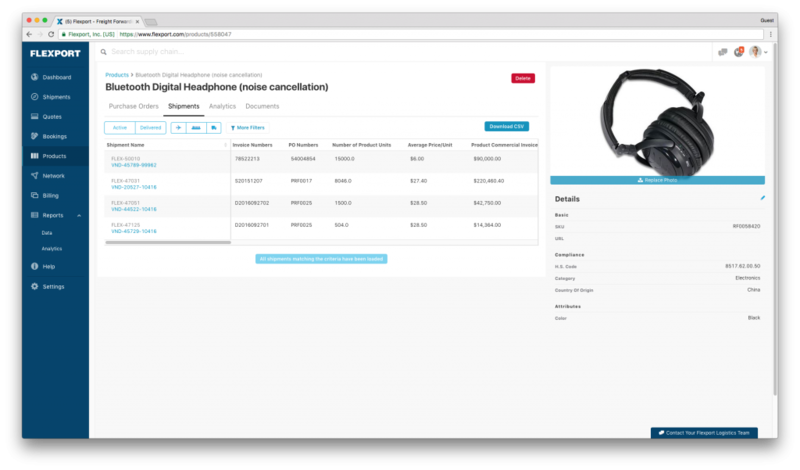 Structured data connections will eliminate costly phone calls, emails, paperwork, and replacing pallet-level consolidations with plane-level optimizations will reduce manual handling costs. Major international airlines are already investing in the technology infrastructure required to make this transition. The passenger sides of their business already have world-class yield optimization programs. And as executives from that side of the business rotate into key roles in air cargo operations, they are opening their eyes to all the money they are leaving on the table. And for the first time in recent memory, the major airlines are enjoying windfall profits they can reinvest in the systems needed to capture the margin currently taken by master consolidators and air freight forwarders. The profit pool in the air cargo market can be split across its three major players: airlines, forwarders, and shippers. As with any significant market shift, we should expect both the size of this profit pool, and way that it is divided between players, to change as airlines adopt real-time dynamic pricing for their cargo. The move to belly-level optimization will allow airlines to reclaim much of the margin traditionally captured by the forwarders and consolidators. The open nature of these systems means that price data will be far more visible to all market players than in today’s environment, where prices are usually discovered by rumors and hearsay rather than in transparent marketplaces. As airlines move toward dynamic, digital pricing and booking engines, it will be harder for forwarders to play competing airlines off one another. While the rise of real-time dynamic pricing and automated booking systems will certainly cut into the forwarders traditional profit pools, it also creates opportunities for modern technology-driven freight forwarders. 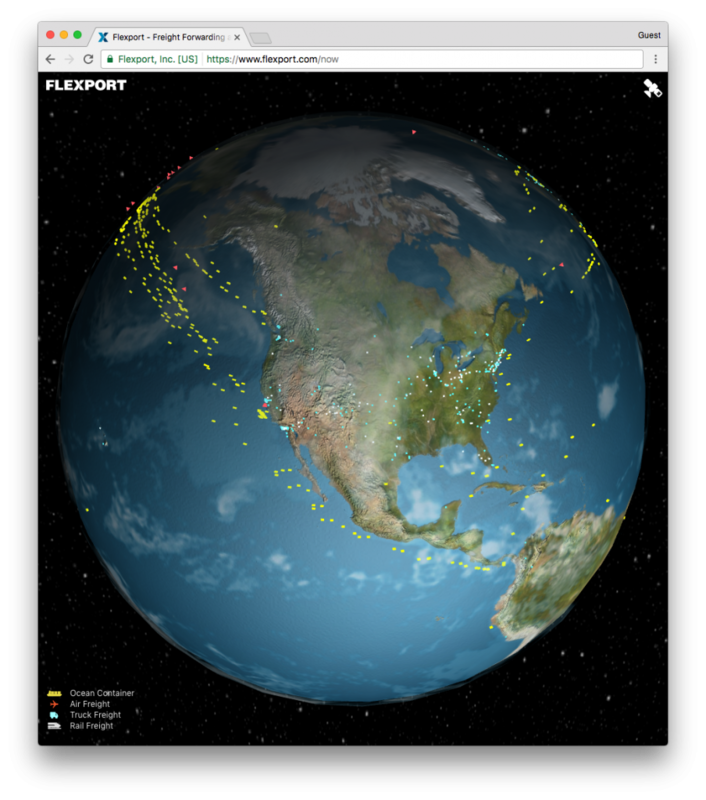 Those, like Flexport, who are building the technology required to connect airlines and shippers enjoy lower transaction costs and more reliable access to capacity for their freight. The new breed of forwarder should also be predictable in its purchasing. By structuring all the data that comes into their businesses—every purchase order, every quote request, every tender, and every shipment—modern forwarders have a far better understanding of our customers’ freight demand, and therefore their own freight purchasing needs. Rather than performing cargo consolidations by eye in a warehouse, new forwarders approach to structured data lets them do mix and match across time and space. They can automatically identify all the cargo coming into our network and dynamically route it to the airline in the region currently paying the most for cargo with those characteristics. Air freight is a perishable good: once that plane leaves, if it’s not full, you’ve lost that revenue opportunity forever. Thanks to a data structured approach, and the visibility and control it gives over the cargo, new forwarders can be a more reliable customer for their airline partners. Their systems get smarter over time as they learn more about how those demand patterns materialize in freight purchasing requirements. At Flexport, we aim to cancel fewer bookings because we better understand our true capacity needs, helping our airlines partners maximize utilization and yields. 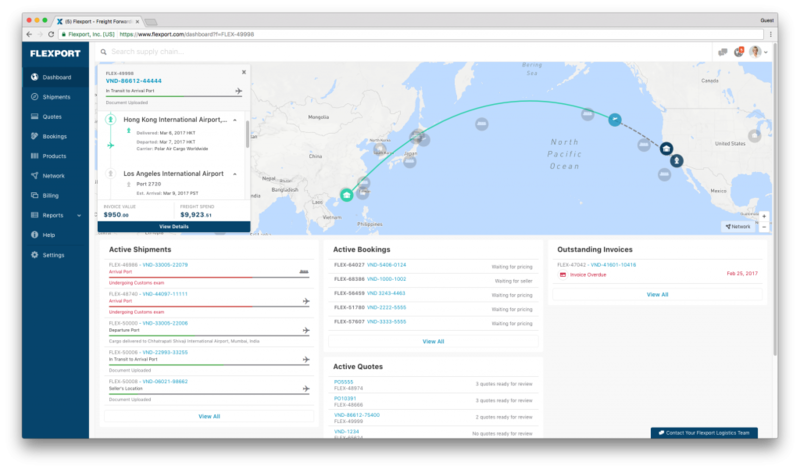 Meanwhile, as we feed our algorithms more and more data about the supply and demand of air freight, our route planning software will continuously improve, allowing us to find hidden margin for ourselves, our clients, and our airline partners. Legacy forwarders who are unwilling, or more likely, unable, to make the leap to the new world of real-time dynamic trading will suffer in this new environment. They will find themselves like the phone-based stock market traders of the last century, displaced by easy-to-use online portals at the low-end, and sophisticated high-frequency trading algorithms at the high-end. Paradoxically, the most established freight forwarders are also the most vulnerable: of the top 25 freight forwarders in the world by volume, not one was founded after 1994, when Netscape launched the first commercial web browser. And making the leap from legacy systems to a modern internet architecture will not be easy. Complex systems evolve, they are not intelligently designed. It will be nearly impossible for any established global forwarder to build a new system to simply implement itself overnight. Unlike passengers who get stranded when a new ticketing system goes haywire, cargo cannot call its spouse, get a hotel room, and rebook itself on the next flight. When your new system fails to work perfectly right from the start, it will lose track of the tens of thousands of shipments in transit, that cargo will vanish into the ether. In that sense, freight is like an unaccompanied minor that needs to be hand-held every step of the way to destination. Switching a freight forwarder’s operations over to a new system all at once is unlikely to go well—it is much better to build something from scratch, and through a process of rapid iteration and agile development, gradually evolve into a superior system. Some legacy forwarders are frantically trying to avoid their pending obsolescence, already hard at work on reinventing themselves as software-first businesses. After some false starts, both DHL and Damco have launched standalone digital freight forwarding brands already this year, and we expect to see all the major forwarders invest tens of millions in IT transformations to prepare for this new digital reality. The biggest winner in this transition should be the shippers. Too many in this industry seem to have forgotten that our businesses exist only to serve these businesses. Today’s system of phone and paper-based transactions, obscured by layers of middlemen mixing and matching freight to arbitrage prices, does little to benefit end shippers. The technology-driven forwarders who are best positioned to compete in this new arrangement have no vested interest in maintaining the large profit margins of today’s forwarders. At Flexport, we are cash flow positive on our transactions while maintaining a gross margin that is nearly half of industry leaders, mainly due to our technology-enabled service model. And as we get closer to purchasing parity with the largest players, we can pass more of the savings back to shippers, making us even more competitive. Even as we save money for clients, our web-based tools are designed to dramatically improve the user experience of shipping freight. By giving shippers more visibility and control over their freight than ever before, we unlock new value from their supply chains. New forwarders are also far more open to the infamous “tri-partite” relationship that directly connects shippers to airlines. A direct relationship between carriers and shippers will make it harder for forwarders to benefit from opacity, while helping airlines better understand customer needs. That will let airlines to differentiate on more than just price, advancing from selling a commodity to a being value-add service provider. Over time, we should expect the air cargo industry to more closely match the ocean freight business in this regard. Most big ocean shippers maintain direct contracts with the ocean carriers, and their global freight forwarding partner will act as coordinating layer, performing functions like planning, routing, scheduling, booking, tracking, and exception management. 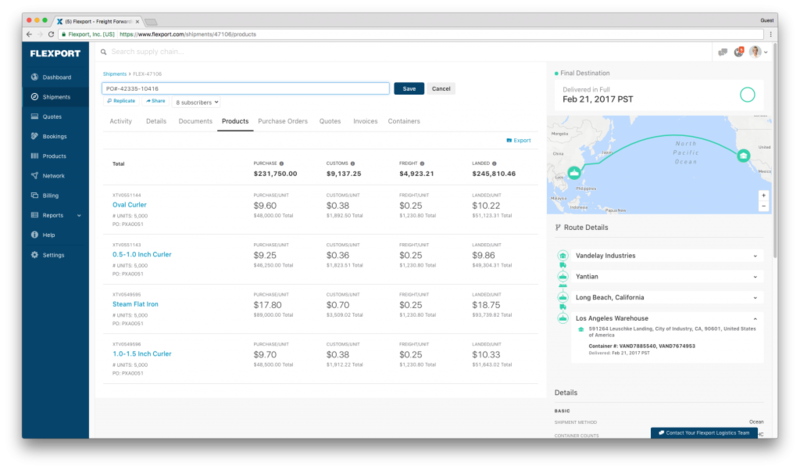 In addition to reducing transaction costs, Flexport’s data-driven approach gives shippers more visibility and control over their inventory in transit. 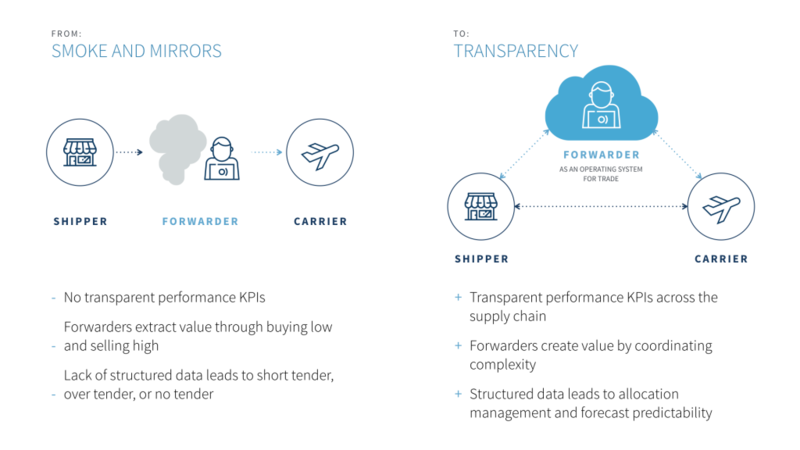 By improving forecasting abilities while allowing us to cut transit times and reduce working capital needs, tech-driven forwarders can unlock tremendous value in shippers supply chains. Shippers reward our relentless focus on working capital reduction with loyalty even when we’re not the cheapest forwarder in the market. But this will take years to play out, right?